First things first, what does "Nourify" mean anyway? "Nour" is the Persian word for light, and "ify" is the suffix used to form verbs that mean making something into a particular state. Light is the most essential element in any picture. In fact, the word "photography" has its roots in Greek and means "drawing with light". Nourify conveys the same message, i.e., giving light to any subject so its reflection is recorded on the image sensor or the film within the camera. 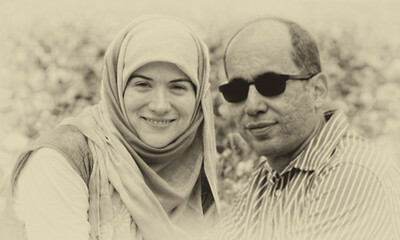 Maryam and Kambiz, a wife and husband team. We have lived in Southern California since the mid-nineties. Both of us are engineers by profession, and photographers and digital artists by passion. Specifically, we both have PhD's in Electrical Engineering from USC and UCLA (how do we get along you ask? well, we try to avoid the subject and stand with our shared house-divided UCLA/USC flag!). Photography and digital art have been our serious passion for many years. We view them as the best tools for capturing memorable moments and creating stunning visual messages. As you can see from our Portfolio, we take shots of a wide variety of subjects, from Abstracts to Children. We love how every subject poses its own unique set of challenges. We believe visual messages and digital art go way beyond simple photographs. As such, together with our clients, we start by specifying the ultimate intended visual message. We will then use various techniques and tricks along with the most sophisticated image processing software packages to turn your pictures into stunning digital art. For our family clients, we envision creating visual life journals presented in the most fabulous and artistic manner. How many times has it happened to you that you regret not having good pictures of a particular moment in your life? Be it huge events like weddings, birth of your children and their birthdays, or smaller events like specific developmental milestones of your baby, or events like school gatherings, or just your visit to a particular park or beach. Well, much like family doctors, accountants, etc., it would be nice to have a family photographer too. Someone who can be called upon on any occasion, big and small, and be trusted upon to deeply care about capturing any given moment in the best possible and the most cost-effective manner. That is what we strive towards. For our commercial clients, we will study the project very carefully, and make sure we understand the intended visual message. We will then work closely with the client to prepare a well-defined Statement of Work outlining all the key requirements and objectives. We then get to work and execute on the plan as best as we can. We do believe that each project and each client can have a different set of objectives, requirements, and challenges. As such, we have a very flexible package pricing structure which can properly be adapted for different clients and various projects. If you have an event, or a photography and digital art project, please contact us and we will be happy to discuss the details, and together with you, come up with a fair package price. Please click on the Contact link at the top of our page. You can also click below to follow us on Facebook or Twitter.